Photo: Julius Boesel House, ca. 1895, Quellhorst Road, German Township, New Bremen, Auglaize County, OH. Listed on the National Register of Historic Places in 1978. Photographed by User:Nyttend (own work), 2010, [cc0-by-1.0 (creativecommons.org/publicdomain/zero/1.0/deed.en], via Wikimedia Commons, accessed August, 2013. Auglaize County administrative offices are located at 209 South Blackhoof Street, Wapakoneta, OH 45895; phone: 419-739-6720. Auglaize County was created in 1848 from Allen County. 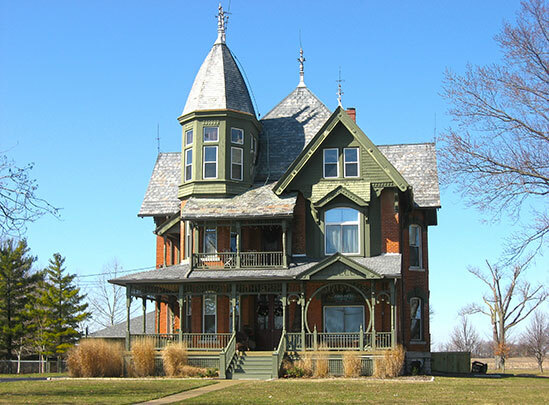 It is named for the Auglaize River, a tributary of the Maumee River.